This is part 1 of our report from Kanuma, part 2 is here. Kanuma city (鹿沼市) in Tochigi Prefecture is known for its gardening soil - Kanuma tsuchi (鹿沼土) and for Satsuki azalea (サツキ). The official city logo is a stylized azalea symbol, by the way. Thanks to the fertile Kanuma soil (maybe?) the official flowers grow in Kanuma very well, so well in fact, that the city has a special event called the Satsuki festival (鹿沼さつき祭り) - sorry, the link’s in Japanese only, which takes place in May. If you are into bonsai (盆栽), you’ve probably used the famous Kanuma soil already. Yes, it's being exported to all corners of the world. Oh, it might be fun to actually show you the symbol of this city. On our photoblog Mrs. Trouble has introduced the stylized Kanuma logo that she happened to spot during her pilgrimages to the driver’s license testing center there last year. The official Kanuma City flag. Mrs Trouble squealed with delight upon seeing it, even though this city has absolutely nothing to do with Judaism!!! Lately, the city has been emphasizing its wood industry (sorry, Japanese only), and not just as furniture making, but also for its design. There are all sorts of wood-related companies located in one particular industrial area. Though if you are a first time visitor to Kanuma, you might be excused for thinking that the whole city is nothing but one huge industrial area. Kanuma is also the birthplace of my grandmother, aged 91. 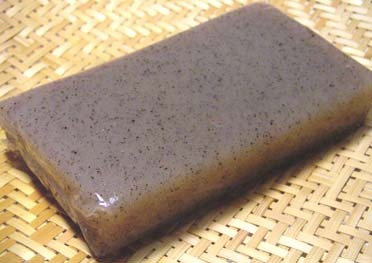 She always buys Konjac (コンニャク) whenever she goes to visit her hometown. Konnyaku from Kanuma is a chi-chi brand among old Tochigi natives, I guess. Image: Wikipedia. Lots of fiber, and low in calories - an ideal snack for keeping yourself fit. Oh, oh, oh, one more you-absolutely-shouldn’t-miss thing in Kanuma is a firewalking festival. Although technically still in Kanuma, it takes place in the middle of nowhere. “Middle of nowhere” as in “mountains, forests and wild bears”, but still within Kanuma city limits. Awesome! That’s one of Mrs. Trouble’s favorite performances. She even confessed that, after videotaping the firewalking event, she wouldn’t mind becoming a Buddhist monk (nun?) at Mt. 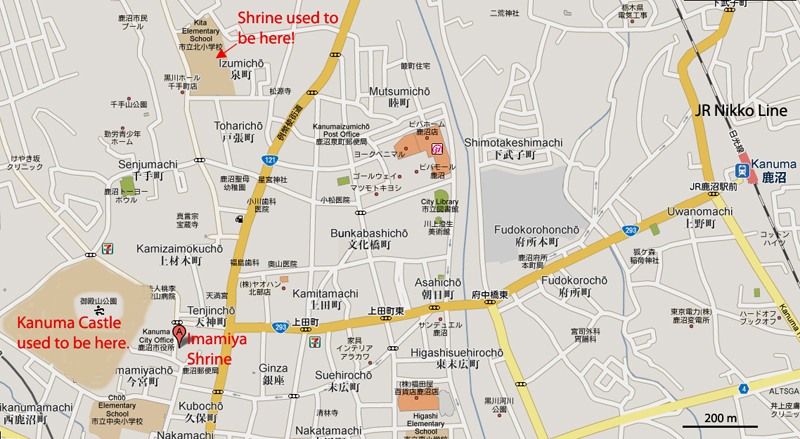 Kongo Zuihoji temple (古峯原金剛山瑞峯寺), if there was such a possibility... I assure you that if that moment comes, I will photograph the ritual ceremony of Mrs. Trouble shaving her head. Just like I did when she botoxed her forehead. But I also like this event because it is one of the very few occasions when you can still witness the ancient style (before the Meiji Era) of religion in Japan - when shinbutsu shugo (神仏習合) - syncretism of Shinto deities and Buddhas was common and no haibutsu kishaku (廃仏毀釈) was instituted. It feels a bit odd seeing Buddhist monks carrying a Shinto mikoshi (portable shrine) and doing Oharai [(お祓い) – a ritual purification ceremony in Shinto. Alright, alright, I can tell you’re getting bored with this “who-cares-about syncretism-of-Shinto-and-Buddhism” stuff… Let’s proceed. 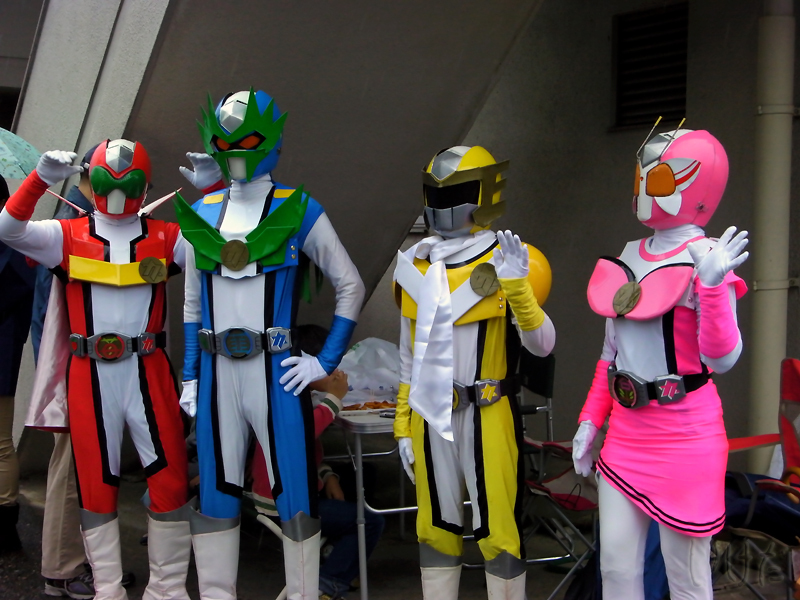 In Japan, on October 9th, 10th and 11th this year we had a long weekend. This was possible thanks to a national holiday called “Health and Sports Day” (体育の日). It commemorates the opening of the 1964 Summer Olympics in Tokyo, and exists to promote sports and active lifestyle, Wikipedia says. It is on that long holiday weekend that Buttsuke (= bump, collision) Autumn Festival takes place at Imamiya Shrine (今宮神社) – sorry, Japanese only - and in Kanuma downtown. This is Rei Taisai (例大祭 - the most prestigious festival in a shrine) of Imamiya Shrine, as you can imagine. This photo, and the one below were taken in 1917. 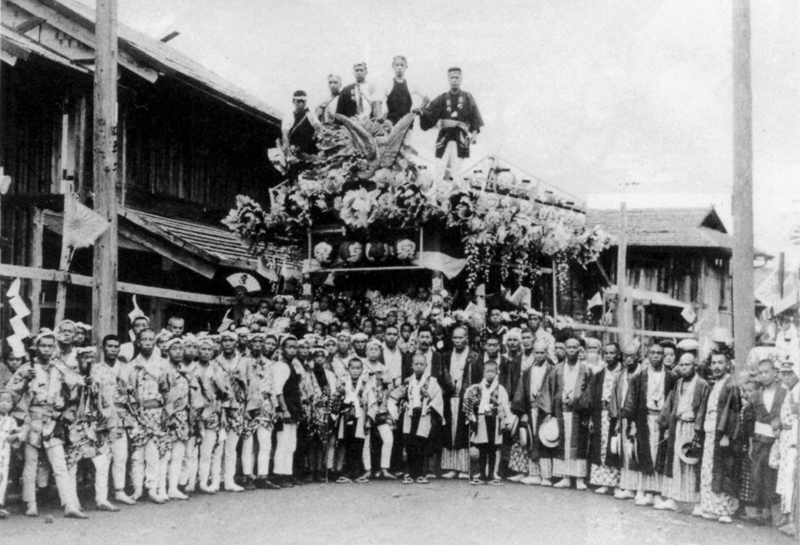 Yatai of Izumi-cho and local people. When this photo was taken is not known. This shrine was built by Monk Sho-do (勝道上人). Without him we can’t describe the history of shrines in Tochigi Prefecture. The guy was very religious and very busy. Three month after his accomplishment in developing Nikko’s Futaara Shrine (日光二荒山神社) in 782AD (or CE, if you prefer), he stopped at Kanuma and found a sacred spot suitable for building yet another shrine. The place was called Gosho no mori (御所の森 - the grove of Imperial Palace). On September 8, 782AD, on that spot he dedicated a shrine enshrining the same three deities that Nikko’s Futaara does - Okuni (大国主), Tagorihime (田心姫), and Ajisukitakahikone (味耜高彦根命). The new shrine was called Nikko Imamiya Daigongen (日光今宮大権現). 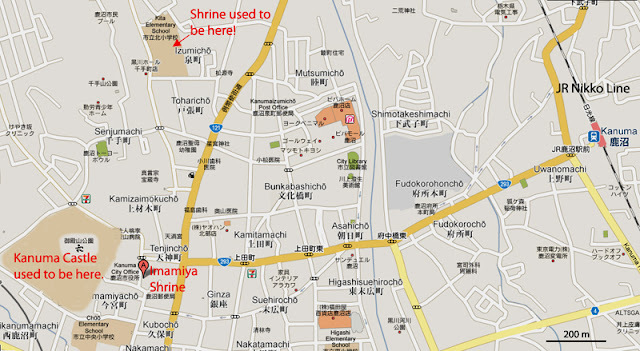 Yes, Imamiya shrine used to be a branch of Nikko’s Futaara Shrine. Here is an interesting thing. The original place where Monk Sho-do decided to build the branch of Nikko’s Futaara is NOT where the current Imamiya Shrine is located. The original location is where the Kita (= north) Elementary School stands now. Who moved it, when and why??? During the Sengoku Period (戦国時代) Tadatsuna UTSUNOMIYA (宇都宮忠綱) sent troops to attack the Kanuma castle and kill its lord - Tsunakatsu KANUMA (鹿沼綱勝). 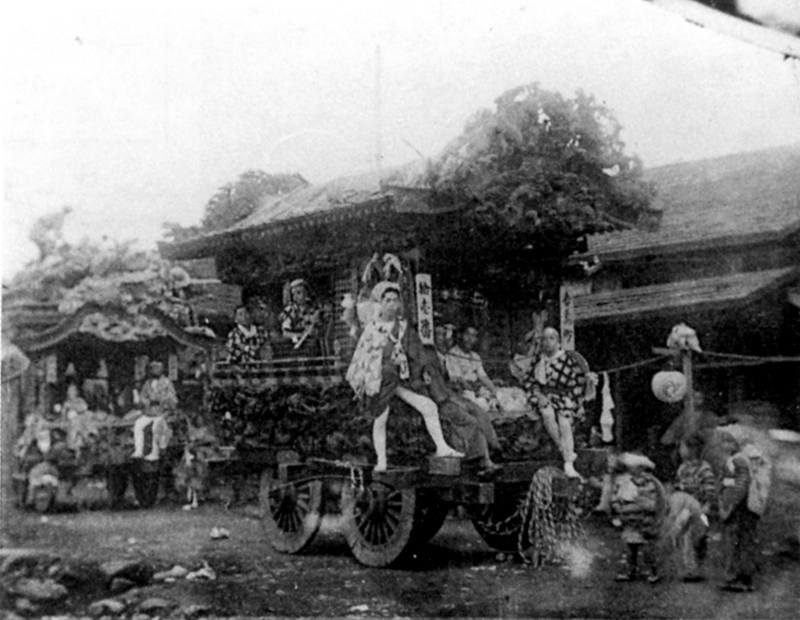 After the battle, in 1532, the vassal of the Utsunomiya clan, Tsunafusa MIBU (壬生綱房), was sent to rule the Kanuma district. He was appointed as the new owner of the castle, and renovated the whole place top to bottom. In 1534 he decided to relocate Nikko Imamiya Daigongen – he wanted to place it by the castle for the prosperity and safety of his clan. Since then, the shrine was called Imamiya Daigongen (今宮大権現). The name of “Nikko” was dropped but the enshrined deities remained the same. In the late 16th century, the Kanuma castle was attacked by the UTSUNOMIYA and YUKI clans and the owner of the castle - the MIBU clan, was terminated there and then. Sadly, despite their best efforts, Imamiya Daigongen did not protect them. 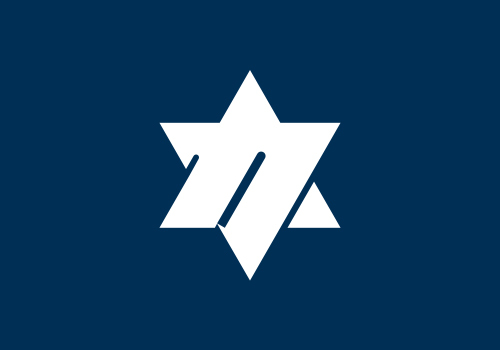 Click on image to view larger size. The grove of Imperial Palace is currently at Kita Elementary School. The present-day Imamiya Shrine is right by the Kanuma City Hall. West of the City Hall is where the Kanuma Castle used to be, but nowodays it’s a park with a baseball field and tennis courts. The Red one is inspired by strawberry, Blue - by garlic chives (one of Kanuma’s local specialties), Yellow - by Kanuma soil (as described above), and Pink - by Satsuki flowers (again, as described above). You can never guess how the festival originated. Mrs Trouble blabbed something about it last year, but here’s the real deal. The year 1608 had astonishingly dry weather. Ujiko (氏子) members (refer to Ujigami - 氏神) of Imamiya shrine and local farmers had no choice but to pray for rain. They organized ritual ceremonies and their begged the gods until the rainfall was granted. To their consternation, after three days of chanting, singing, dancing, praying and whatever else they could come up with, the long anticipated rain clouds emerged out of nowhere and a huge thunderstorm overwhelmed the town (village back then?). The rains came down on June 19th in the lunar calendar, and the festival called Yoi matsuri (宵祭り - eve of a festival) was established on that day, with Rei sai (例祭 - an annual festival) on the following day - June 20th. 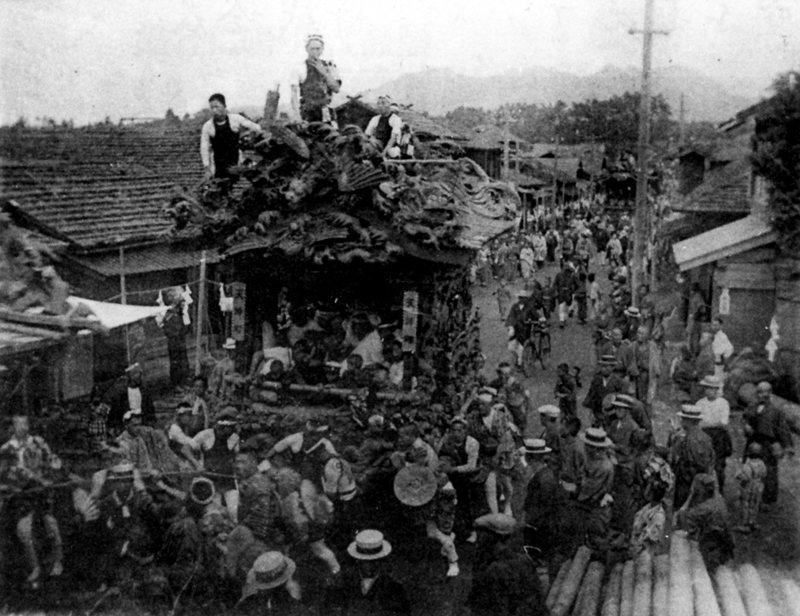 From the Taisho Period to Showa 23 (1912-1948), the festival took place on September 9th (one day only). In 1948, the Local Autonomy Law [(地方自治法) was passed at the National Diet of Japan (国会 - take it easy, it's a parliament, and has nothing to do with national dieting), and accordingly, the schedule of this festival was also changed to its current time in October. Since this event has 402 years of history, many things, including its schedule, changed from time to time, but one thing stayed constant. Even now, the festival tends to bring rainy weather, at least for one day. The ancient Kanumans wish is still being granted, even in 21st century... it’s so reliable, isn’t it? More photos from Kanuma Buttsuke 2010 are here and here and here and even here. And oh yeah, here too. (No worries, these are links to our photoblog). More videos can be found in part 2 of our report. Or if you prefer, you can go directly to our YouTube channel. Plenty of other goodness there, too. And please subscribe when you're there! Thnx!